DOHaD – Patrick F. Clarkin, Ph.D. Recent images coming out of war-torn Yemen are heartbreaking. After three years of fighting between Houthi rebels and a Saudi-led coalition (backed by the US, UK and France), an estimated eight million people are near starvation. The war has exacerbated the nutritional situation in what was already one of the poorest countries in the region, causing infrastructure to crumble and unemployment rates to skyrocket. A blockade of Yemen’s ports has also led to a rise in food prices and to a lack of medical supplies, leaving people dependent on insufficient amounts of food aid. A malnourished infant in Yemen, with a low upper arm circumference (source: BBC). This has been building for a while. Nearly two years ago, a BBC report cited statistics from the UN that 370,000 children in Yemen were starving. Even infants, who may be buffered from difficult economic conditions via breastfeeding, were not spared as many mothers were too malnourished to produce milk. 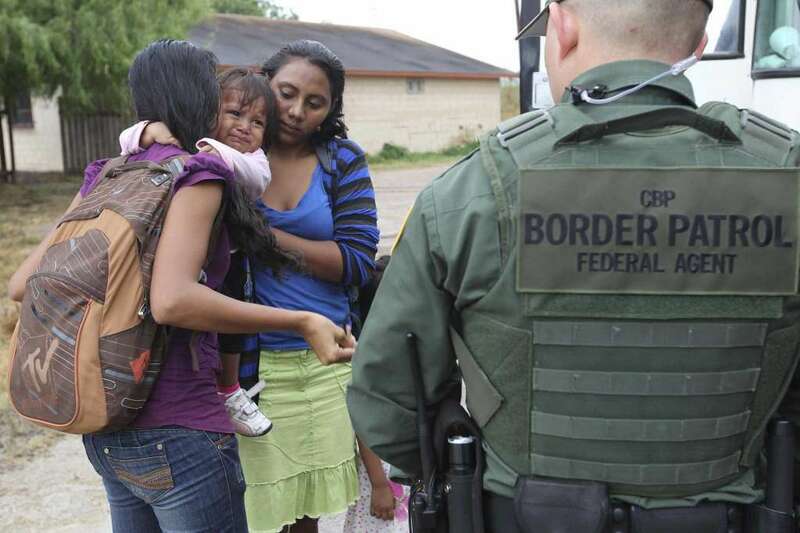 An infant cries as U.S. Border Patrol agents process a group of immigrants in Granjeno, Texas, June 2014. (Photo: Jerry Lara, Staff / San Antonio Express-News). Several advocacy groups immediately denounced the policy as cruel and inhumane, including Amnesty International, the ACLU, and the Women’s Refugee Commission. The group Kids in Need of Defense stated that in addition to being cruel, the policy would make it more difficult to process cases for families who are seeking asylum from violence, since it is harder to get information from parents and children who are kept in separate places. The need to process asylum cases efficiently is especially relevant today. Last year saw 294,000 people from Central America (primarily El Salvador, Honduras, and Guatemala) claim asylum or refugee status in other countries as they fled from rising levels of violence. According to UNHCR , that number was sixteen times higher than it was in 2011. In addition, roughly 714,500 people in Guatemala, Honduras and El Salvador remained internally displaced in June 2017. That is, they were forced from their homes but had not crossed an international border. Data from the Igarapé Institute in Brazil show that homicide rates in Central America are among the highest in the world , with levels of violence that rival war-torn countries. Furthermore, the number of Central Americans seeking asylum had also increased in Belize, Mexico, Panama, and Costa Rica, showing that while some cases may be economic migrants looking for work in the U.S., many are simply desperate people fleeing organized gang violence, human trafficking, extortion, and corrupt police/ judicial systems. And some may choose to leave based on a combination of factors. Regardless of the cause, it cannot be an easy decision to make, particularly for parents. “Between 2013 and 2015, the US government authorised the deportation of more than 300,000 Hondurans, Guatemalans and Salvadorans with criminal records, many of them children of refugees from the 1970s and 1980s. Another 550,000 Mexicans were also deported over the same period. Fontanini added that “we need the states who are receiving these people to invest in longer-term solutions.” What that would entail, she did not say. But it is clear that instability perpetuates itself, and that this does not stay neatly contained within national borders. It is also clear that innocent Central Americans are being crushed between organized crime in their home countries and a sense of indifference or hostility from neighboring nations. President Trump even went so far as to say about “unaccompanied alien minors” (i.e., children), “they look so innocent. They’re not innocent.” The implication was that organized criminals, including members of the notorious gang MS-13, were infiltrating across the border with some pretending to be asylum seekers. The statistics show that this does occur, though rates appear to be low. According to The New York Times, 240,000 unaccompanied minors entered the US between 2012 and 2017. Only fifty-six of those were linked to MS-13. There is a moral imperative to avoid painting innocent people as the very perpetrators of violence from whom they are fleeing (the same could be said about refugees from Syria and other war-torn countries, who are often conflated with terrorists). Furthermore, Trump’s claim was contradicted by his Chief of Staff, John Kelly, who indicated that the primary reason for preventing immigration from Central America was more about assimilation than crime. The stiffest tree is readiest for the axe. Early in life, our bodies are like unmolded clay, ready to be shaped by our experiences. For some of us, that matching process can create problems. If circumstances change, we could end up poorly adapted to our adult environment. A child born into harsh conditions, though, may have to take that risk in order to make it to adulthood at all. The Hmong in French Guiana may be an example of this process. They are a fascinating population for many reasons, the most obvious being that they are there at all. A few dozen refugees from Laos first resettled in French Guiana in 1977, a few years after the Vietnam War, after they and the French government agreed that life in small, ethnically homogenous villages in a tropical environment was a better option than acculturating to the cities of Métropole France. The experiment paid off. Today, more than two thousand Hmong are farmers in the Amazonian jungle, producing most of the fruits and vegetables in the country. The result is a level of economic autonomy and cultural retention that is likely unique in the Southeast Asian refugee diaspora. Scenes from Hmong villages in French Guiana. (Clockwise from top left: fields of Cacao, young men going on a hunting trip in Javouhey, swidden agriculture of Cacao, a street lined with farmers’ trucks in Javouhey. Looking through the 5 most frequently read essays of 2017, I see few themes. They are mostly attempts to find reasons to be hopeful (even though that has been hard at times). Humans are adaptable and flexible, and we aren’t fated to any single behavioral way of being. That means we can always make a better world. Light up the darkness. A variety of skin colors. From the Humanae Project, by Angelica Dass (source). Who’d want to hurt Spiderman? This was by far the most read post on this site, which I wrote after the violent clashes in Charlottesville, Virginia. This was upon seeing a photo of a man with a t-shirt that quoted Hitler in which he wrote that ours is “a world of eternal struggle.” I found it disturbing, but also just wrong. In evolution, adaptations are context specific, and they depend on the conditions of the game. This is also true for cooperation and conflict. “How we view the world matters. If we see it as zero-sum, as an eternal struggle against other people where only one party can win, then we will act accordingly. Norton and Sommers (2011) found that many white people see racial relations as a zero-sum game: that if other groups are making progress toward equality, that this progress comes at their expense. But remember that non-zero-sum relationships are widespread. With cooperation so prolific in nature (genes, cells, organisms, groups, human societies), it just seems odd to declare that life is solely a contest of struggle. Nor does it make sense to say that cooperation is impossible between groups. Or we can see it as a chance for coalitions, that the success and well-being of others around us does not require us to lose. We make a niche for the others around us, as they do for us, and we all decide whether the costs that come with building up our armor are worth it. They may be, depending on how we perceive the conditions of the game. In 2013, Orlando Sotomayor, a professor of economics at the University of Puerto Rico-Mayagüez, looked into whether two hurricanes in 1928 and 1932 impacted the long-term health of the people of the island. He specifically explored whether people exposed to the hurricanes prenatally had higher rates of various chronic diseases and lower education levels decades later. He framed this within what used to be referred to as the fetal origins of disease hypothesis, but is now usually called the DOHaD (developmental origins of health and disease), acknowledging the importance of development beyond the fetal period. In a nutshell, the DOHaD is based on decades of evidence that various biological insults (malnutrition, maternal psychological stress, pollution) in the prenatal and early postnatal stages of life may predispose individuals to chronic diseases later in life. This has been linked to type 2 diabetes, coronary heart disease, and hypertension (Barker 1994), schizophrenia (Wahlbeck et al 2001), osteoporosis (Cooper et al 2009), and possibly cancer (Walker and Ho, 2012). In one of the best-known examples, women who were pregnant during the Dutch “hunger winter” in World War 2 had offspring who had a higher risk of various conditions by the time they reached middle age, including a doubled rate of coronary heart disease, obesity, and diabetes in adulthood (Rooseboom et al 2011). They also had an increased chance of having schizophrenia and depression, and did worse on cognitive tasks. While famine conditions are not necessary to have such impacts (poverty and deprivation operate in a dose-like fashion), the well-defined period of the “hunger winter” provided a way to compare exposed and unexposed persons. Professor Sotomayor viewed the decades-old hurricanes in Puerto Rico as akin to something like the Nazi-imposed famine in the Netherlands. There are differences, obviously. Disasters resulting from intentional, anthropogenic (human-generated) disasters like war usually end up leading to protracted humanitarian crises (Schultz et al 2014). While natural disasters are often devastating, they are usually short-lived and can be ameliorated by humanitarian aid, whereas unsafe conditions during war often makes such assistance logistically difficult. Of course, aid following natural disasters depends on the scale of destruction, a country’s pre-disaster wealth and access to resources, and the political willingness of neighboring countries to assist. 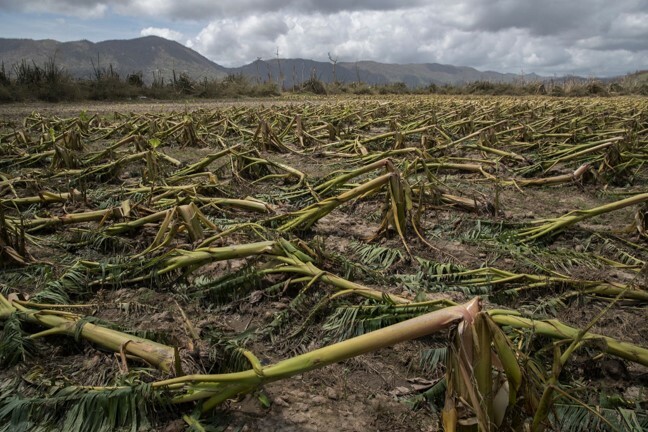 Hurricane San Felipe (1928) and hurricane San Ciprian (1932) both had devastating effects on the agrarian economy of Puerto Rico, with damages estimated to be about one-third and 20% of national income, respectively (Sotomayor, 2013: 282-3). Coffee, citrus, and sugar cane crops were particularly affected. Using data from the CDC Behavioral Risk Factor Surveillance System surveys, Sotomayor looked at people born between 1920 and 1940, and defined those individuals born in the years immediately following the hurricanes (1929 and 1933) as having been exposed to difficult early life conditions. Unfortunately, month of birth was not available in the dataset, so year of birth had to suffice. In all, the sample comprised 11,990 individuals, with 1,197 defined as being exposed to the effects of the hurricanes in early life. 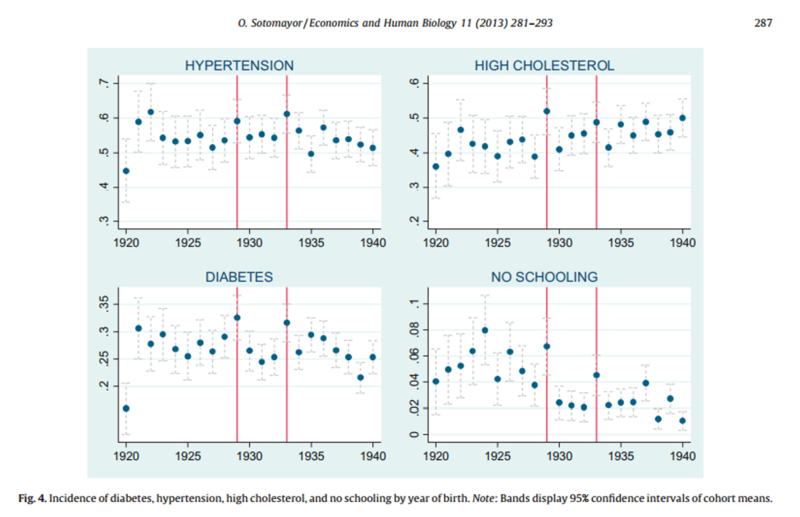 Overall, he found that exposed individuals were more likely to be diagnosed with hypertension, high cholesterol, and diabetes, as well as be more likely to have no formal schooling. This latter outcome variable was interpreted as possibly being a “cognition shock,” suggesting that exposed individuals may have had some decline in mental faculties resulting from poor early neurological development. Incidence (and 95% confidence intervals) of chronic diseases and lack of schooling in Puerto Rico by year of birth. People born in 1929 and 1933 were viewed as being exposed to the effects of a hurricane in early life (Sotomayor 2013). We can speculate whether something similar might result from hurricane Maria, which made landfall on Puerto Rico on September 20 of this year. As a Category 5 hurricane, it was among the most powerful ever recorded and its devastating effects likely won’t be resolved anytime soon. 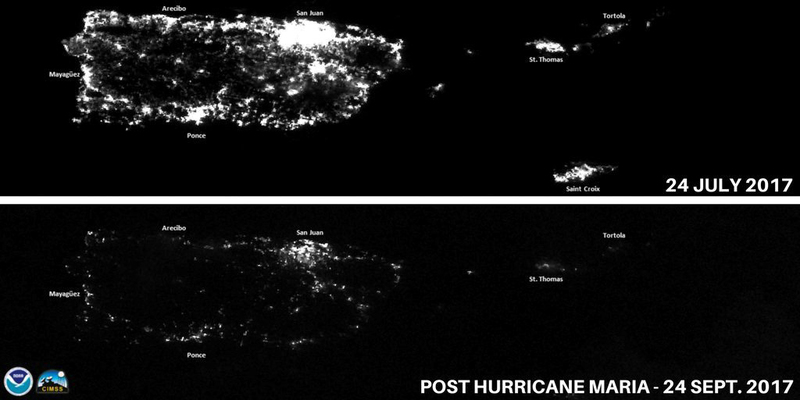 It has been estimated that more than 1,000 people died as a result of Maria, while a substantial proportion of the population still remains without electricity, months later. Similarly to Hurricanes San Felipe and San Ciprian, Maria destroyed up to 80% of Puerto Rico’s agriculture, and rates of food insecurity have increased (rates were already high before the hurricane). Reports indicated that following the hurricane, many people on the island had to skip meals and waited in lines for hours waiting for emergency food supplies, as relief supplies were below standards that were available in other recent hurricanes that hit Texas and Florida (even though all are American citizens). According to CBS News, more than 215,000 people left Puerto Rico for Florida between October 3 and December 5, and it’s been projected that perhaps more than 470,000 people will leave in the next two years (and up to 750,000 people over the next four). Proportionally, this is a staggering loss of population on an island that had 3.4 million people in 2016. Barker DJP. Mothers, Babies, and Disease in Later Life. BMJ Publishing; 1994. Birth weight is often used as a rough gauge for the quality of the prenatal environment. A newborn who weighs 2500g or less (about 5.5 pounds) is considered to be “low birth weight” (LBW). At the individual level, weight alone is an imperfect measure because of confounders such as gestational length (it’s axiomatic that the less time spent in the womb, the less time there is to grow). However, at the population level, if average birth weight fluctuates, then it is an indication that something in the environment probably has changed. Sometimes, stressful changes can be low-intensity and chronic; at other times, they can be abrupt and dramatic. Biologists, psychologists, and bioanthropologists might call these changes “stressors” or “insults.” Economists might use the term “shocks.” They’re both getting at the same idea: to what extent can harmful environmental factors affect growth and health outcomes? In the case of a natural disaster, the harm done can be substantial. Florencia Torche (2011) found that rates of LBW increased following the 2005 Tarapaca earthquake in northern Chile. Despite the magnitude of the earthquake (7.9 on the Richter scale), the amount of destruction was relatively limited: eleven people died, and 0.035% of the population had to temporarily relocate to shelters. This was attributed to the low population density of the region as well as Chilean preparedness and building codes to withstand earthquakes. Although the damage was not as severe as it could have been, Torche reasoned that the earthquake likely caused acute maternal stress, which in turn could affect prenatal development. Looking at over half a million births, Torche used maternal county of residence as an estimate of the earthquake’s intensity across different trimesters of exposure. She found that mothers who were lived in the most intensely affected regions during the first trimester were the most affected. The probability of LBW increased from 4.7% to 6.5%, while rates of pre-term births also increased from 5.2% to 8.0%. Later periods of gestation were not substantially affected, and for infants who were conceived after the earthquake, the probability of LBW returned to baseline. Again, these outcomes seemed to result primarily from acute psychological stress stemming from the earthquake. Torche reasoned that – given the relatively low amount of damage to infrastructure – the increases in LBW and pre-term births were unlikely to have resulted from other factors such as malnutrition, infection, stress resulting from deprivation, strenuous workloads, or exposure to environmental toxins. In reality, it’s not possible to control for all of these variables entirely, but overall it seems plausible that maternal psychological stress played a substantial role in birth outcomes. The war in Syria has to end, eventually. However, the tragic reality is that the damage is likely to last for decades. Yesterday, The New York Times reported that in the past few days “tens of thousands of civilians” have fled the city of Aleppo as the Syrian military, aided by Russian jets, have tried to reclaim the area. This is only the latest wave of civilians being forcibly displaced by the war. Altogether, the UN estimates that more than half of Syrians have been displaced from their homes at least once. Some of these have crossed into other countries, while the rest remain internally displaced.